At Potomac Communications Group, we’re well known for our work in helping clients communicate credibly in a crisis or when stakeholders are angry about a decision that will affect their community or when they don’t trust you or the industry you represent. 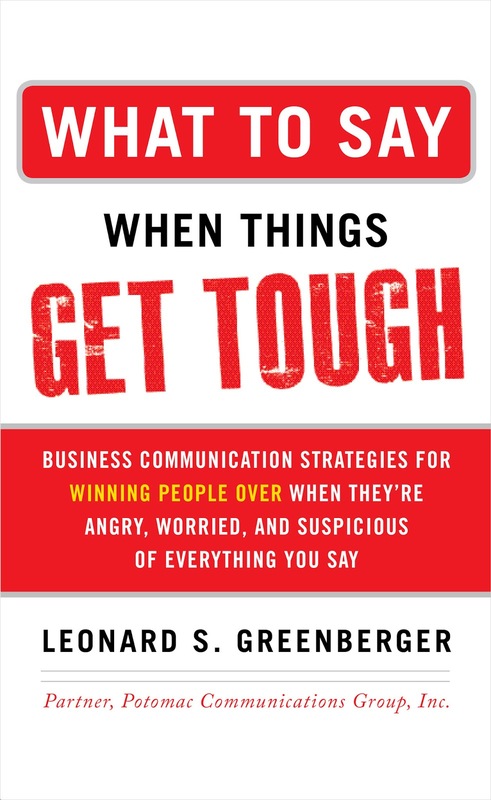 So, I’m very pleased to announce the publication of PCG Partner Leonard Greenberger’s first book, What to Say When Things Get Tough: Business Communication Strategies for Winning People Over When They’re Angry, Upset, and Suspicious of Everything You Say. 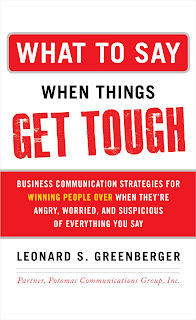 In the book, Leonard uses many of PCG’s real-world experiences to illustrate how to win people over by understanding how people assess risk in tough situations, how to send the right verbal and non-verbal messages, and how to establish and maintain trust and credibility. He also provides basic training on how to conduct media interviews, including a fool-proof model for answering difficult questions. To learn more about the book, order copies or book Leonard for a speaking engagement, please visit our book webpage at www.pcgpr.com/whattosay. By now, you’ve likely heard that the Associated Press’s Twitter account was hacked yesterday. For anyone who may have missed it, hackers sent out a tweet using the AP feed reporting explosions at the White House that injured President Obama. While the AP worked quickly to correct the misinformation via its other social media outlets and website, we quickly saw the impact of just one erroneous tweet. 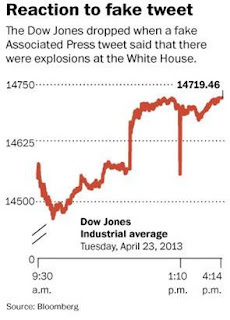 Most notably, the Dow Jones Industrial Average dropped more than 100 points in the moments after the tweet was sent, but it recovered just as quickly when the AP announced that it had been hacked and the information was false. White House Press Secretary Jay Carney even noted that President Obama was fine during yesterday’s press briefing. This one instance, which took place in a matter of minutes, really drives home the influence that social media has in today’s world. 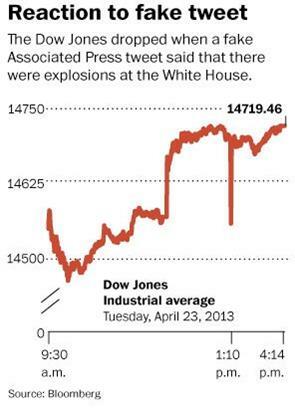 In the ongoing race to be first, news outlets are increasingly breaking news via social media. (The number of outlets that have reported misinformation via social media in breaking news situations is another topic for another day.) In fact, a study released last year by the Pew Research Center for the People and the Press found that one-third of adults under the age of 30 get their news from social media platforms. Today, social media allows us to get information and communicate faster than ever. But as we saw yesterday, it also has the power to rattle Wall Street. While some things – like getting hacked – can be out of your control, yesterday’s tweet serves as a reminder to be mindful of what you read and to double check information before taking it as truth.